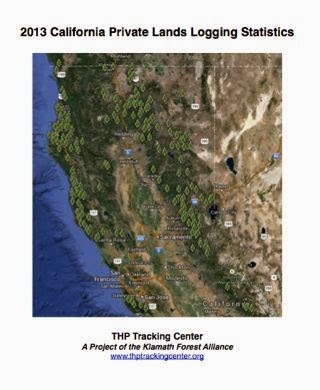 The 2013 California Private Lands Logging Statistical Report is now available for download from the THP Tracking Center website Resources Page. You can also download the reports for 2010, 2011 and 2012 which highlight trends with state and private lands logging. These statistics are derived from all the individual THPs (Timber Harvest Plans) submitted to Cal Fire during the calendar year, which the THP Tracking Center reviews and comments on. Within the report; you will find information on statewide logging trends, logging trends by Cal Fire district, logging information for each county, and for major timberland owners. Although there are many trends contained within the report, some trends are worth highlighting between 2012 and 2013. Clearcutting is up 2% statewide, group selection logging is up 3%, sanitation salvage logging is up 4%, and selection logging is down by 7%. One of the most watched trends - clearcutting; increased 33% for Cal Fire Region 1 (coast), increased 11.33% for Cal Fire Region 2 (Sierra north/Trinity) and decreased 26.72% for Region 3 (Sierra south). Calaveras, Del Norte, El Dorado, Humboldt, Modoc, Shasta and Siskiyou counties all saw increases in the rate of clearcutting. For large timberland owners, Green Diamond Resource Company increased their rate of clearcutting by 37%, and Roseburg Resources Company increased their rate of clearcutting by 17%. What trends can you find in the report? W.M. Beaty & Associates to log NE of Shingletown, CA. This THP is about 8 miles NE of Shingletown, CA at an elevation of 4,720 to 5,870 feet. W.M. Beaty & Associates is planning a tractor based logging operation in ponderosa pine, sugar pine, incense cedar, Douglas fir, white fir and lodgepole pine forests. There are 24 road drainage sites planned for work including rocking, dip construction and culvert repair and replacement. Two ringtails, and one red tailed hawk were reported within the THP area. There is a sharp shinned hawk nest .75 miles south of the THP area, a cooper’s hawk nest 1.2 miles NE of the THP area, and a goshawk nest .7 miles south of the THP area. A pacific fisher sighting was reported 1 mile SE of the THP area. More information is available on the THP Tracking Center website. 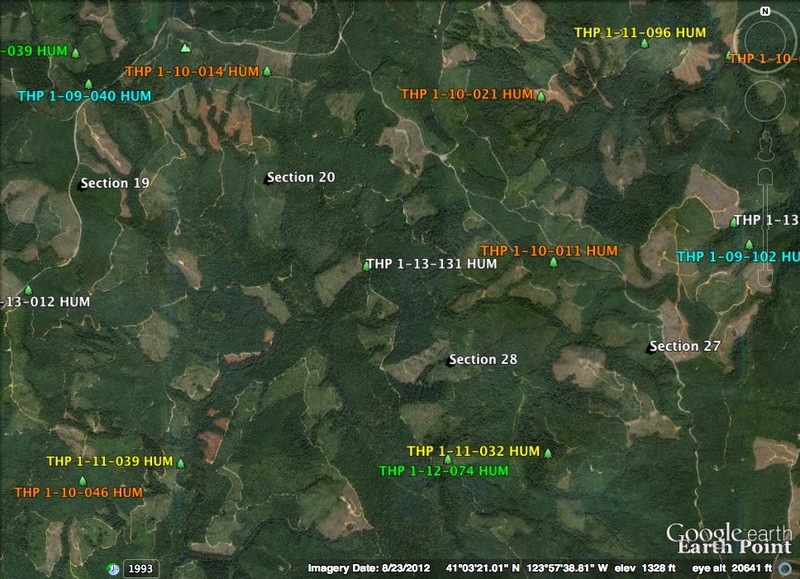 Roseburg Resources Company planning clearcut THP near McCloud, CA. This THP is about 1.4 miles north of the town of McCloud, CA and Highway 89 at an elevation of 3,600 to 4,480 feet. The THP area is just SE of Mt. Shasta and flows into the Mc Cloud River upstream from Mc Cloud Reservoir. It is also close to an intake pipe owned by the Mc Cloud Municipal Water District. 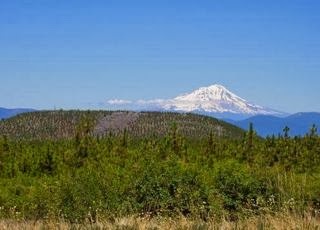 Roseburg Resources Company is planning a mostly clearcut tractor based logging operation in white fir, ponderosa pine, incense cedar, Douglas fir and sugar pine forests. There are 2 goshawk territories nearby, and Wilkin’s harebell was found at 4 locations outside of the project area east of unit 1902. More information is available on the THP Tracking Center website. 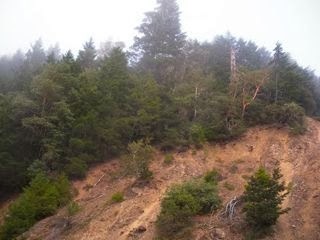 Mendocino Redwood Company to log on steep and unstable slopes near Rockport, CA. This THP is about 3 miles NE of the town of Rockport, CA on the Mendocino coastline at an elevation of 1,240 to 1,960 feet. The THP area flows into the South Fork of the Eel River which is listed as impaired for sediment and temperature. Mendocino Redwood Company is planning a tractor and cable logging operation in redwood and Douglas fir forests. There are 3 unstable areas including a skid trail failure in unit 2, an unstable area near a class III watercourse in unit 9, and a skid trail at the bottom of an unstable area in unit 5. 20 road drainage sites are planned for work including rocking, dip construction, ditch cleaning and culvert repair and replacement. Humboldt Milk Vetch was found on several haul roads. More information is available on the THP Tracking Center website. 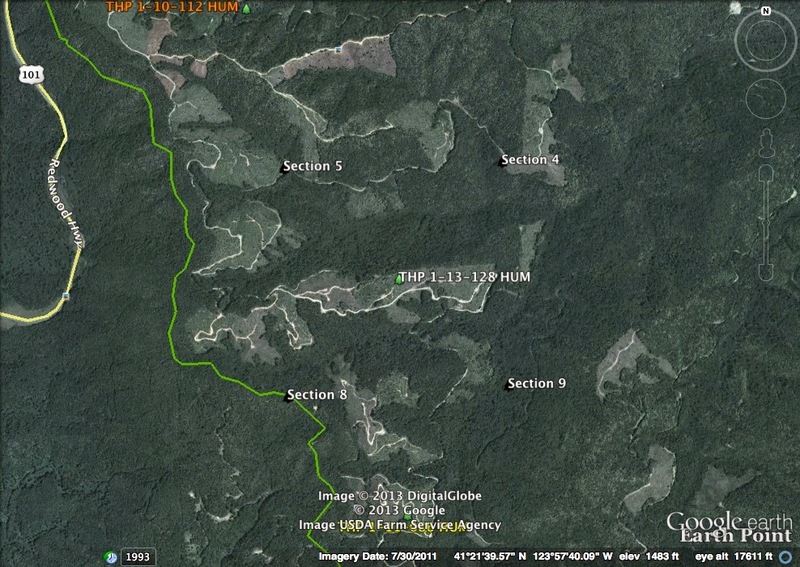 Coastal Ridges LLC to log on steep and unstable slopes near Willits, CA. This THP is about 6 miles SW of Willits, CA near Highway 20 at an elevation of 1100 to 1880 feet. The THP area flows into the North Fork of the Big River which flows into the Big River which is listed as impaired for sedimentation and temperature. Coastal Ridges LLC is planning a tractor based logging operation on steep and unstable slopes in redwood and Douglas fir forests. There are several landslide terrain sites including debris slides, cracking and disrupted ground, and multiple road failure sites including fill failures, gullying, cut bank failures and a slide partially blocking a road. Coastal Ridges LLC wants to use several skid roads within a class III watercourse, use ground based equipment on steep slopes over 65%, and on slopes over 50% with a high erosion hazard. They also want to re-construction several segments of existing steep roads to reduce the grade. 60 road drainage sites are proposed for work including rocking, dip construction, culvert repair/replacement and road bed re-construction. For spotted owl site MEN0196; nesting/roosting habitat is deficient and will not be harvested within .7 mi, however foraging habitat will be reduced by 112 acres within .7mi. For spotted owl site MEN0309; foraging habitat will be reduced by 164 acres within .7mi. More information is available on the THP Tracking Center website. Green Diamond Resource Company planning THP near Big Lagoon and Highway 101. 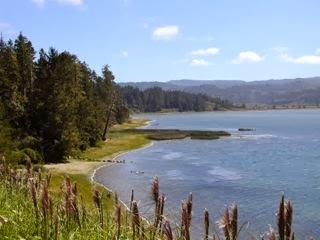 This THP is about 8 miles north of Trinidad, CA near Big Lagoon and Highway 101 at an elevation of 120 to 760 feet. The THP area drains into Maple Creek which contains coastal cutthroat trout, steelhead, coho and chinook salmon. 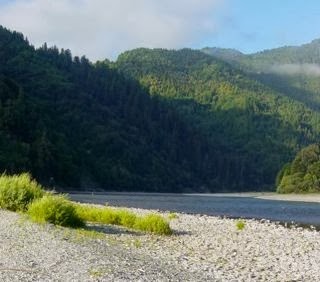 Green Diamond Resource Company is planning a tractor, feller buncher and shovel logging operation in second growth redwood, Douglas fir, Sitka spruce, and grand fir forests. There is 1 road failure site proposed for re-construction that has dropped 4 feet at a failed class II watercourse crossing. Twelve road drainage sites are planned for work including rocking, dip construction, culvert repair/replacement and road bed stabilization. There are 2 bald eagle nests within .3 miles of unit A, and .44 miles of unit B, and osprey nests within .25 mi of unit C, and several haul roads. The closest spotted owl nest is located within .5 mi of unit B, and there is marbled murrelet habitat within .25 mi of unit A, and a haul road. More information is available on the THP Tracking Center website. Humboldt Redwood Company to log near Grizzly Creek Redwoods State Park on steep and unstable slopes. 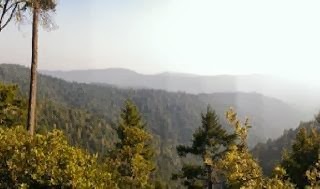 This THP is about 7 miles east of Scotia, CA just off Highway 36 near Grizzly Creek Redwoods State Park. The THP area drains into the Van Duzen River which is listed as impaired for sediment and temperature. Humboldt Redwood Company is planning a tractor, cable and helicopter logging operation in redwood, Douglas fir and grand fir forests at an elevation of 300 to 1,550 feet. The THP area has over 70 active and dormant landslide terrain features including debris slides, debris side slopes, disrupted ground, earth flows, rockslides and inner gorges. There are some misc road failure sites including cutbank failures and fill failures. Humboldt Redwood Company is planning to use ground based equipment in areas designated for cable logging, and to use helicopters for logging which often are used to remove large trees off steep and unstable slopes. There are 16 road drainage sites planned for work including rocking, dip construction, ditch cleaning, culvert repair/replacement and temporary bridge construction. A sharp shinned hawk nest was located just outside of unit 1, and there is willow flycatcher habitat within .25 mi of unit 1. More information is available on the THP Tracking Center website. Pacific Gas & Electric Company to log near DeSabla Lake NE of Chico, CA. This THP is about 4 miles north of Magalia, CA off Skyway Road near DeSabla Lake. Pacific Gas & Electric Company is planning a tractor based logging operation in ponderosa pine, Douglas fir, incense cedar, sugar pine and white fir forests at an elevation of 2,160 to 2,900 feet. 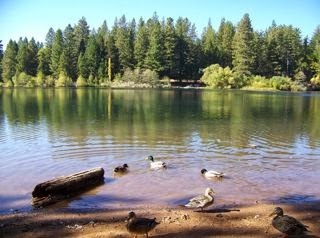 DeSabla Lake has a PG&E picnic area, camp with 17 cabins and is a popular fishing and hiking area. The THP area flows into the Forks of the Butte and eventually into the Sacramento River which contains a spring run chinook salmon run and steelhead. Construction of several skid roads and crossings in a class III watercourse are planned, and there are 31 road drainage sites planned for work including rocking, dip construction and culvert repair and replacement. Three sensitive plants were reported including dissected leaved toothwort, white stemmed clarkia and butte county fritillary. More information is available on the THP Tracking Center website. 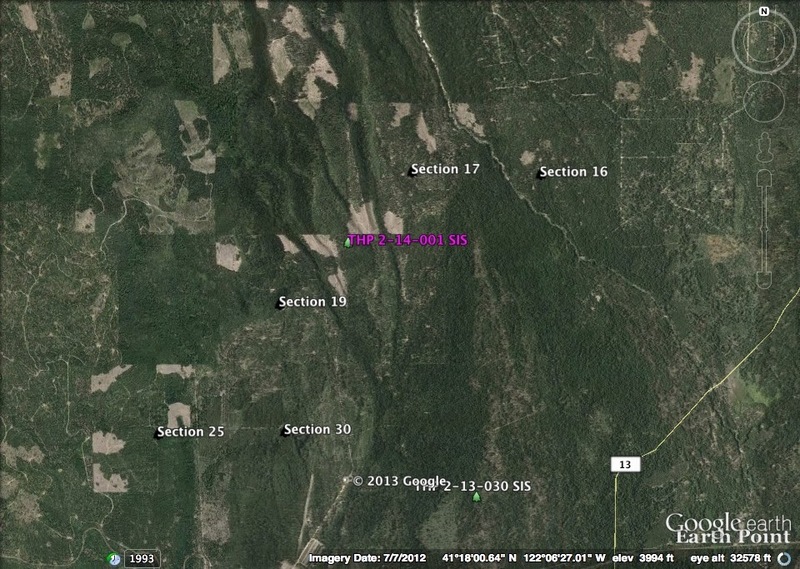 Green Diamond Resource Company to clearcut log near Klamath, CA. This THP is about 5 miles SE of Klamath, CA and Highway 101 near Redwood National Park at an elevation of 560 to 1,200 feet. Green Diamond Resource Company is planning a tractor and cable logging operation with a significant amount of clearcutting on steep and unstable soils in redwood, Douglas fir, hemlock and western red cedar forests. The THP area drains into the Klamath River which is listed as impaired for sediment, nutrients, dissolved oxygen and temperature. There are 3 landslide terrain sites including active and dormant slides; and 7 misc road failure sites including fill failures, slumping, cracking, diversions and the formation of sink holes. Over 11,505 feet of new temporary and seasonal road construction is planned. Green Diamond Resource Company is proposing to use a road as a landing in a class II watercourse in unit E, construct 3 spur roads on steep slopes over 20% grade in units D and F, and re-construct a road within a watercourse in Unit F. 21 road drainage sites are planned for work including rocking, dip construction, culvert repair/replacement and road bed stabilization. Marbled murrelet habitat is located within .38 mi of the THP area on Redwood National Park lands, and there are spotted owl sites within .25 mi of units B and C. More information is available on the THP Tracking Center website. Campbell Timberlands planning a pair of THPs on steep and unstable slopes near Leggett. This THP is a few miles SW of the town of Leggett, CA near Highway 1 at an elevation of 1,000 to 1,840 feet. Campbell Timberlands is planning a tractor and cable logging operation in coast redwood and Douglas fir forests on steep and unstable slopes. 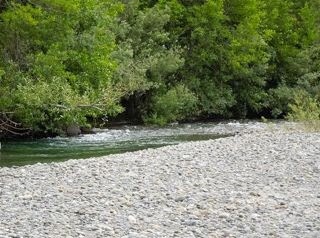 The THP area drains into the South Fork of the Eel River which is listed as impaired for sediment and temperature, and contains steelhead, coho and chinook salmon. There are 2 fill failure related road failure sites and 4 landslide terrain sites including debris slides, earth flows, steep streamside slopes, and inner gorges related to watercourses. Campbell Timberlands is planning to use ground based equipment on unstable soils, use ground based equipment on several skid roads within a class II watercourse, and use ground based equipment on steep slopes over 65% grade. There are 18 road drainage sites planned for work including rocking, dip construction, culvert repair/replacement and road bed stabilization. For spotted owl site MEN0098; this THP will remove 13.5 acres of foraging habitat within .7 mi, and 29 acres of nesting/roosting habitat within .7 mi., and for spotted owl site MEN0106; this THP will remove 6.5 acres of foraging habitat within .7 mi, and 9.6 acres of nesting/roosting habitat within .7 mi. White flowered rein orchid was reported to be within the THP area. This THP is adjacent to Campbell Timberlands’s recently submitted Lower Hollow Tree THP 1-13-135 MEN. This THP is a few miles SW of the town of Leggett, CA along Highway 1 (Highway 1 is adjacent to units E, F and G) at an elevation of 1,050 to 2,120 feet. Campbell Timberlands is planning a tractor and cable logging operation in coast redwood and Douglas fir forests on steep and unstable slopes. The THP area drains into the South Fork of the Eel River which is listed as impaired for sediment and temperature, and contains steelhead, coho and chinook salmon. There are 8 unstable areas including steep streamside slopes near units A and E, multiple debris slides, shallow landslides and debris slide slopes near units F, D and Highway 1. Campbell Timberlands is planning to use tractors on deep seated landslide terrain in units A and F, and to use tractors on steep slopes over 65% grade in units C and D. There are 22 road drainage sites planned for work including rocking, dip construction, ditch cleaning and road repair/replacement. For spotted owl site MEN0106; this THP will remove .10 acres of foraging habitat within .7 mi, and 2.6 acres of nesting/roosting habitat within .7 mi. This THP is adjacent to Campbell Timberlands’s recently submitted Poughkeepsie THP 1-13-133 MEN. More information is available on the THP Tracking Center website. Mendocino Redwood Company to log in marbled murrelet stand near Manchester. This THP is about 5 miles NE of Manchester, CA and Highway 1 on the Mendocino Coast. Mendocino Redwood Company is planning a tractor and cable logging operation in redwood and Douglas fir forest at an elevation of 420 to 1,960 feet. There are 13 landslide terrain features including scarp failures related to steep slopes near watercourses and older roads, and a debris torrent. 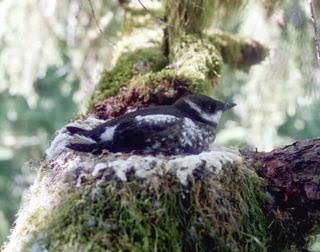 The THP area is partially located in the South Alder Creek Marbled Murrelet Management Area which is occupied to the west. 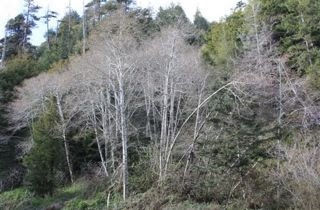 Lower Alder Creek is thought to house the largest marbled murrelet breeding colony in Mendocino County. Six road drainage sites are planned for work including rocking, dip construction, and culvert maintenance and repair. More information is available on the THP Tracking Center website. 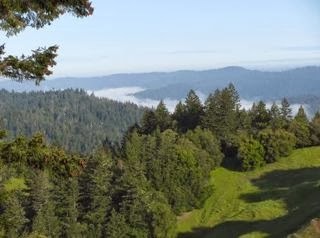 Green Diamond Resource Company to clearcut south of Redwood National Park. This THP is about 9 miles east of Trinidad, CA and a few miles south of Redwood National Park at an elevation of 290 to 3,380 feet elevation. Green Diamond Resource Company is planning a mostly clearcut feller buncher, shovel and cable logging operation in redwood, Douglas fir, grand fir and western hemlock forests. The THP area is at the Headwaters of the Little River which flows into the Little River, an important steelhead, coastal cutthroat trout, chinook and coho salmon fishery. Green Diamond Resource Company owns over 94% of the Headwaters of the Little River watershed which has been heavily clearcut in the past. More information is available on the THP Tracking Center website. Humboldt Redwood Company to log on steep and unstable slopes near Humboldt Redwoods State Park. 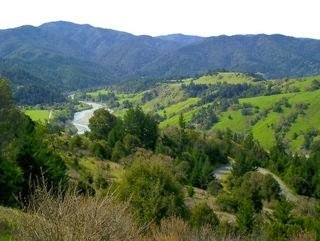 This THP is about 3 miles NE of the town of Honeydew, and the Mattole River at an elevation of 600 to 2,900 feet. The THP area flows into the Mattole River which is listed as impaired for sediment and temperature, and contains coho, chinook salmon and steelhead. Humboldt Redwood Company is planning a tractor, cable and helicopter logging operation in Douglas fir and grand fir forests. The THP area contains over 60 landslide features mostly related to steep watercourses including debris slides, debris slide slopes, earth flows, inner gorges and disrupted ground. Unit #1 is also adjacent to Humboldt Redwoods State Park. Humboldt Redwood Company is planning to use ground based equipment on skid trails with slopes designated for cable logging. 21 road drainage sites are planned for work including rocking, dip construction, culvert repair/replacement and road bed stabilization. A Cooper's hawk nest was found within 500 feet of unit 1. More information is available on the THP Tracking Center website. Campbell Timberlands planning road study near Westport and the South Fork of Wages Creek. This THP is about 5.5 miles SE of Westport, CA at an elevation of 600 to 1,640 feet. Campbell Timberlands is planning a tractor based logging operation in coast redwood and Douglas fir forests. The THP is the first in a sequence of plans that will study the impacts of road construction vs timber harvest on sediment production in the South Fork of Wages Creek. 1.2 miles of road construction are planned with 14 acres of harvest within the 80 foot road right of way. 429 feet of road construction is planned on slopes between 50 and 65%, and 262 feet of road construction is planned on steep slopes over 65%. There are 2 road failure sites including cut bank and fill failures, and 18 road drainage sites are planned for work including rocking, dip construction, ditch cleaning, culvert repair/replacement and road bed stabilization. More information is available on the THP Tracking Center website.